When I was a kid, this story scared the poop out of me. Now that I'm a wise old codger (ha), it seems very silly and illogical, without much of an ending. 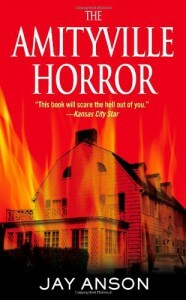 The writers throw everything but the kitchen sink at the poor Lutz family - it winds up being a mish-mash of several popular stories, including The Shining, The Exorcist, and every haunted house story ever written. I was around eight when the film version came out, which was perfect for giving the movie and story a supreme place in my too-keen imagination. I'm a sucker for stories of demonic habitation, so regardless of how bad the writing is (comes off a bit like an NBC Dateline Mystery), it still holds my interest. Call it the haze of nostalgic reverence.